This shows Cromford Court's front drawing room, or at least part of it as it was, and remains, a large room. Its big windows provided a great deal of natural light and the upper part of each window is mullioned. Interestingly, although there is net on the lower panes, the curtain poles above the windows are bare. When it was designed the plasterers must have been first rate as they produced some exquisite work on the ceiling, above the fireplace and around the doors and windows. The room was then lit by gas. Look closely and you will see three guests seated in chairs around the fireplace. Several local hydropathic establishments, such as The Royal Hotel, also had similar wicker chairs as they were fashionable at that time. 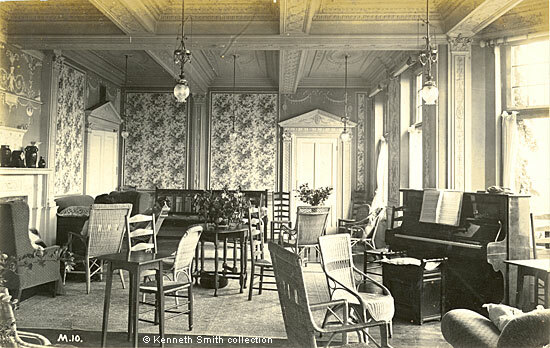 In the 1930s groups of carol singers in the district raised money for charity and it was undoubtedly in this room that a group of Cromford Court's guests practised for a carol concert in 1933 when the Willersley and Cromford Court guest-houses joined forced. Mrs. A. Barker (Cromford Court) and Mr. F. Mutton (Willersley Castle) acted as conductors. Miss Barbara Grundy, of Derby, a member of the Cromford Court party, gave a solo. Untitled photographic postcard (Matlock Bath, Woodbank), No M.10. Published by Hirst, Photo, Birch Vale, via Stockport. Unused, but other cards were posted in 1912.